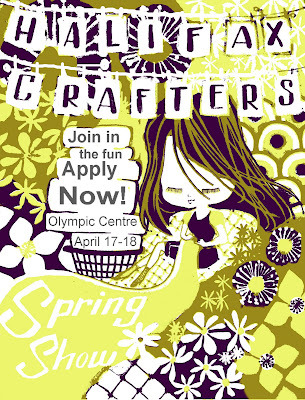 Applications are available now for the April 17-18th show at the Olympic Centre. Email halifaxcrafters@gmail.com for application form: due date is FEB 22! I think this is a wonderful, unique event. I just have one little thing that is bothering me, the application process requires up to ten printed images, plus application forms. If you get more than 100 applications this turns out to be a whole lot of paper waste. I hear the crafters bring their own mugs and produce products in an ecologically responsible way, but the application process doesn't reflect these values at all. I think you should seriously consider this. I agree, I spent good money on prints for my application that I would like to get back, not landfill. A great idea would be to include return postage stamps with the applications, and or have a bucket of them for artists to pickup before the event. And you're right, they should seriously consider this if they want it to be all old fashioned and all. hi Bryce and Paul, we have tried to have our application be an e-mail process in the past, but it led to a tremendous amount of work for us volunteers to re-format and re-size everything to prepare for jurying. we would love to have an uploadable application on our website, so if you know of anyone that would be willing to volunteer some website programming, we would love to hear from them! we are all volunteers here, with regular jobs and families, so we are doing our best to put on this event. I think a return-envelope with postage is a great idea, I'll bring that idea to our next meeting. we do recycle all of the applications that we receive, so they don't end up in the landfill.